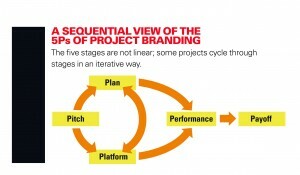 Team Based » Archive » Does Your Project Have a Brand? Have you ever noticed that some projects benefit from high-profile status that draws participation and support while others seem to languish somewhere in the back row? If you have observed this phenomenon, you aren’t alone. Our interviews and observations over a 10-year period have uncovered a huge gap in the “common body of knowledge” associated with the project management profession. Too many project leaders get so caught up in the usual tools and metrics that they fail to consider their roles as marketers within their organizations. We believe the missing link for project leaders is branding. Consider a commonly accepted definition of a brand: a unique value proposition that creates preference and loyalty among key audiences. This translates to project environments as follows: key stakeholders in your organization will be influenced to support your project if they believe in the value your project is likely to deliver. Their impressions of your project are critical to your success as project leader. Plan: Demonstrate competence and transparency in the planning process. Involve key players whose support is critical to your success. Performance: Keep an open book on project performance, and demonstrate resilience in the face of challenges. Don’t hide bad news. It will come back to bite you. Payoff: At the end of the project, communicate results and lessons learned. Acknowledge the contributions of all who participated. This ends things on the right note and sets the stage for a positive brand image on your next project. By adopting a brand mindset, you can increase the likelihood your project will enjoy the support it needs.